Pizza. Yeah, I know, real original. But hear me out. Back in the day when I used to visit Rebecca at college, we always ended up making a quick, easy and cheap meal. The pocketless pita pizza. Say that a few times fast. It was your traditional pita pocket (but without the pocket kind) with some pizza sauce, cheese and whatever toppings. Slip em in the oven for a few minutes and time and time again, we had a great meal. But it wasn’t that crazy good pizza pie that you sometimes crave. And as we moved into the condo, we began making pizza more and more. 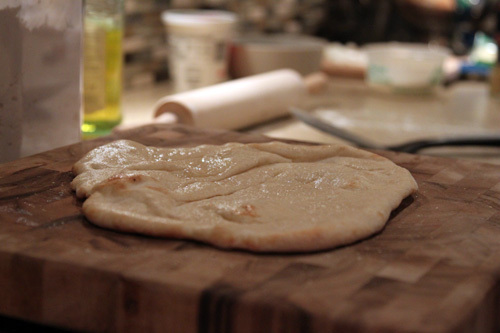 We would often pick up fresh dough from a local pizzeria, roll it out ourselves, apply toppings and bake as needed. Even these pies, though, were missing something. 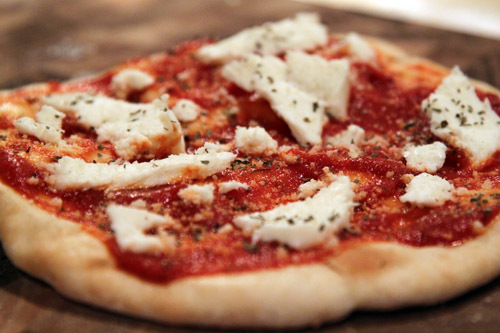 We like our pizza thin, crispy and well done; something that is incredibly hard to get using a traditional oven. 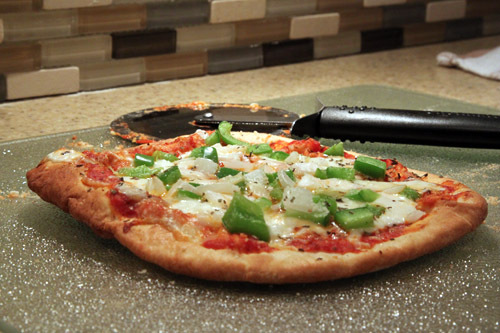 Doing some googling and what not, we came across the ever-popular pizza stone. The stone did help our pies get a bit more crispy, but not enough. Our residential ovens just do not get hot enough like a pizzeria oven. That’s when I got the idea to bake the dough by itself for a few minutes on the pizza stone. This would allow the bottom of the dough to get nice and crispy without soaking in the moisture from the various toppings. I typically bake the dough just enough so that it’s slightly turning a tannish-brown; as seen below. I’ll then rub a bit of olive oil around the entire surface. This allows for the crust to get even more crispy and well done; just the way we like it. At this point, it’s time to get creative: add whatever sauce you like, whatever cheese and whatever other toppings you can come up with. We typically go with Don Pepino’s pizza sauce. I know, I know, I should be making the sauce homemade. But honestly, Pepino’s sauce is the closest sauce to an actual pizzeria sauce. Pizza with peppers and onions has long been one of our favorites, so it’s almost always a must when we’re making pizza. We like to dice our veggies small so they, too, get a bit more crispy. 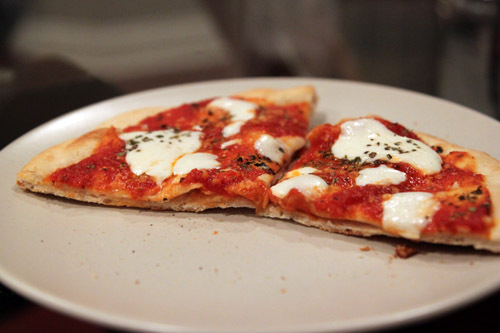 When we have fresh ingredients, we try to make margherita pizza. Unfortunately on this day, we only had fresh mozzarella to use. But otherwise, we would have put on some chopped tomatoes and fresh basil. Instead, we stuck with the regular sauce and some dried basil. Still pretty damn good. And finally, we did get a bit creative. 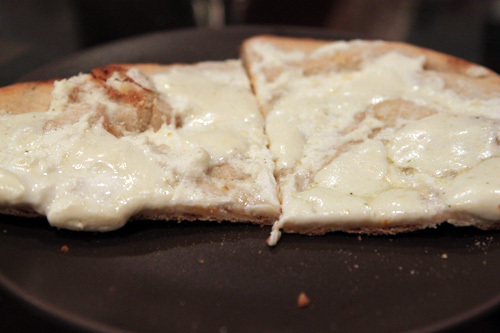 We decided to do a white pizza with ricotta and mozzarella cheese. Can’t wait to make this one again! Now I’m hungry again, but I do have hockey tonight so more pizza making will have to hold off until tomorrow night! 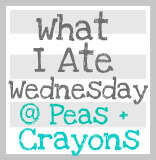 ps- We’re linking up to Jenn’s What I Ate Wednesday party over at Peas & Crayons, go check out the other meal ideas! YUM! I love pizza. We just moved to a town with great brick oven pizza so we have not made our own in a while, but this post may just change that. Thanks! 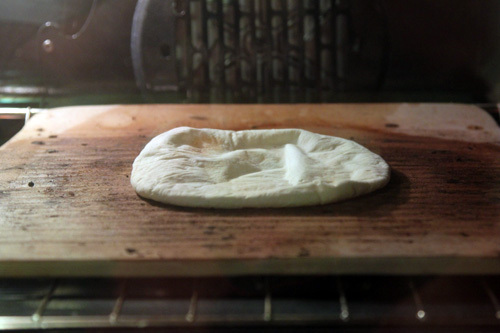 Pat and I just got a pizza stone and are having A LOT of trouble getting the dang dough on the stone, you should have seen me superbowl Sunday… I basically had it in calzone form, then I unfolded it. … does cooking the dough before help that? Do you guys also have a peel? Yup! 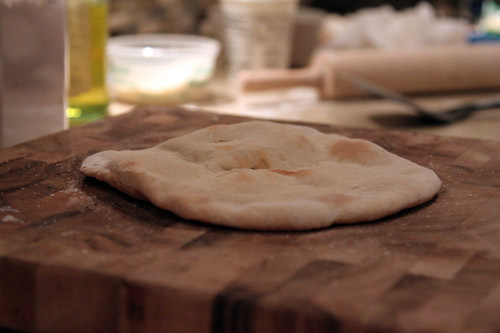 Cooking the dough slightly will make it a bit stiff so you can easily work with it. By work with it, I mean take it off the pizza stone and onto a surface to put sauce+cheese., and then put it back onto the pizza stone to bake some more. We do have a peel and I use that when my pie is a bit more on the medium-large size than ridic small. I used the peel tonight (we made much larger pizzas tonight than usual) and the peel worked great. this looks so good and i don’t even like pizza! 🙂 it’s dan’s favorite so i think doing something like this is how we’ll both win. i can do one without the red sauce (yuuuck) and he can get all crazy with his toppings. 🙂 thanks for the idea! !